Lanthorn is a peculiar settlement – named for the magical lanterns set atop its gates, the perpetually-shrouded village is situated under a massive overhang in Kuldor Pass, where winters are long and cruel and summers but brief. Heavily defended and fortified, the settlement controls traffic through the pass and represents a gateway to the untamed wilderness beyond. Governed by a conclave of powerful wizards with an economy fueled by adventurers and fortune-seekers commissioning magic items, the village also is home to a thoroughly atypical tribe of matriarchal goblins the Flaming Skull tribe, who also act as the village’s miners, digging strange and potent metals from the earth for their eldritch masters. These goblins have also found a pool of bubbling, highly volatile liquid deep within the mines, which helps against the ever-present threat of trolls…which seem to be drawn to the mines in an inexplicable compulsion. Indeed, the theme of a city under siege and goblin propensity towards lighting foes ablaze both are represented well in the depiction of the unique settlement, making it feel very much unique – and yes, the alliance between the grand conclave of sublime artificers and the flaming skull has resulted in almost all shops being owned by goblins…so while healing services can be found, they often boil down to experimental surgery and cauterization and food…well. Let’s just say that it’s available. Half-orcs seem to also be viable business owners here, lending a martial and somewhat rough-and-tumble edge to the settlement, while at the same emphasizing arcane sophistication in a weird, yet compelling blending of themes. It should come as no surprise that goblins are pretty keen on making lots of wands of fireball in a place where some families actually have a troll-baiting and – burning history. From a rules-relevant perspective, we get the proper pieces of information regarding the settlement’s stats and the classic market-place section is similarly included. The settlement’s stats make use of the under siege property, which has been included for your convenience. Prices of food and accommodation can be found for the respective establishments and, as always 6 whispers and rumours have been included as red herrings/adventure seeds. The pdf also includes the classic sections of lore that PCs may be familiar with and a total of 6 events that the GM can use to further kickstart adventuring, should the PCs dawdle. As a minor complaint, the second entry reads “As #2, but this merchant caravan…” – that should be “As #1…”. Life in Lanthorn is surprisingly ordered and peaceful and nomenclature is provided in the settlement statblock, though no general dressing habits and the like are included this time around. On the criticism side, the pdf does offer some truly tantalizing concepts: You see, the magical lanterns of the place are rumored to be sentient and seem to exhibit fiery, destructive capabilities – that we don’t get siege weapon/magic device stats for them is somewhat a lost chance. Similarly, aforementioned volatile troll-exploding liquid would have deserved proper alchemical stats as far as I’m concerned: The marketplace just notes double fire damage…double of what? On the plus-side, the village does offer something amazing: Beyond the well-done standard map, we also get a lavishly-illustrated side-view-version of the village in b/w – big kudos for this very evocative piece. Editing and formatting are top-notch, I didn’t notice any glitches beyond aforementioned minor hiccup in the event table. Layout adheres to RSP’s smooth, printer-friendly two-column standard and the pdf comes with full bookmarks as well as a gorgeous map by Maciej Zagorski, of which you can, as always, download high-res jpegs if you join RSP’s patreon. The pdf comes in two versions, with one being optimized for screen-use and one to be printed out. Creighton Broadhurst’s Lanthorn is one absolutely AMAZING settlement. I adore this place. The explanation of the atypical nature of the Flameskulls makes the tribe work even in the context of PFRPG’s re-envisioned and modified goblins. The place’s visual representation is glorious and the threat of trolls serious enough to warrant magical laser-lanterns. (At least that’s how I picture them.) 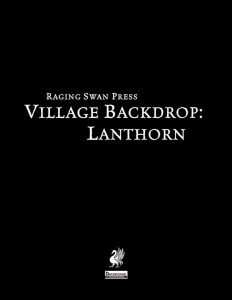 In short – this pdf has it all – Lanthorn is a fantastic village and, for me as a person, one of the coolest in the whole product line. At the same time, I was slightly disappointed by the lack of mechanical stats for the eponymous lanterns and the killer-troll-burn liquid, which are obvious key components of the village. Sure, a GM could handwave those…but having precise stats for them would have been the icing on the cake, at least for me. Hence, the Pathfinder-version misses my seal of approval by a small margin, making the pdf clock in at 5 stars. You can get the cool settlement here on OBS!